Do you remember the good old A-Z competiton run many years ago???? Well I bought a complete set of packs from a scrap shop and never ever used them. 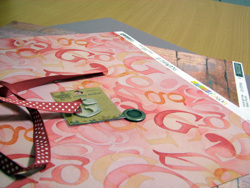 Packs include cardstock, colour fusion alphaworks papers, basic grey papers and embellishments (matching 'scrap metal' alpha and 2 others - includes ribbon, buttons, brads, flowers etc). From memory I paid more than $10 per pack.